IBM® offers storage solutions that address the key needs of storage efficiency and data protection and retention. 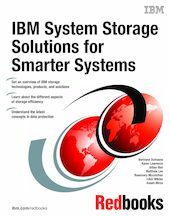 This IBM Redbooks® publication shows that IBM has the technology, products, and services to help keep your storage systems enabled and your business flourishing. This book has been written for those most concerned about efficient, protected, and available data, along with maintaining their IT environment at a competitive price. The audience for this book is that of IT professionals, such as CEOs, CIOs, CFOs, practitioners, information architects, and current and prospective IBM clients and Business Partners.